I have had a number of slow cookers over the years…I find that I don’t use them much for dinner preparation…but I do like them for things I would braise all day anyway…like tough roasts, caramelizing onions, and cooking stock. I have had some kind of slow cooker ever since Rival brought out the Crock Pot in the 70’s. Myrna is not a slow cooker fan…she thinks it makes chicken stringy for instance, and I don’t cook chicken in mine either. My main slow cooker is now a Cuisinart Multi-cooker…It browns and then slow cooks…I love the fact that I don’t have to dirty a separate pan for browning so I use this one more than my Crock Pot brand ones. The non-stick finish has some complaints in online reviews…so far mine is holding up. It also is programable...very nice. Some older crockpots did not reach a safe cooking time fast enough…my older red oval Crock Pot that I liked was one of those models so I discarded it…it was pretty old anyway. Since then I have seen the suggestion of preheating the pot so it would come up to temp fast enough…that might have worked. I also have a newer crockpot that literally boiled my stock…not what I consider slow cooking, and a small one I purchased very cheaply at a pre-Christmas sale last year. If my current model gives out, I will have to search for a more expensive one that also browns, or perhaps go back to stockpots and roasters in the oven, the way Grandma cooked. Some recipes to get your started, along with a few more coming up later in the week. I still am using the Farberware Country-Crocker-Cooker that my now husband gave me for Christmas when we were dating in the 70's. I was still living at home, not even out on my own yet. That is when I learned that if I said I liked something, I might end up with it. He got me a Coleman camp stove one year, too, and I still have it, as well. The crock pot is a bucket shape with a bail handle to carry it with a vegetable motif on the front and a heavy duty lift out crock. 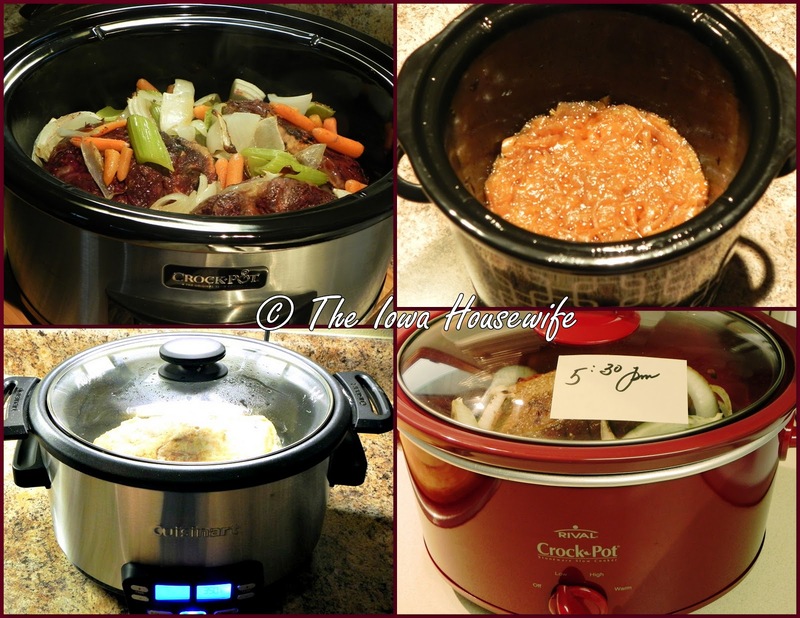 I also have a couple of Westbend crockpots - they are that rectangular style that could be set on a burner to brown meat before adding other ingredients. And like you, I also bought a small one on sale at Christmas a couple of years ago. I use it mainly for things like cooking dry beans or a few beets, etc.